In this blog post I will show what's different under the hood (at first glance) between the cross-platform agents of OpsMgr 2012 R2 and OpsMgr 2012 SP1. This post will probably be updated as I'll find more to share. Both agents are running on Ubuntu 12.04.1 LTS. I use the root account for administration. I know, I should not use it, but hey what the heck. It's just a test environment. The SSH client I use is PuTTY. In both versions the 'scxadmin' tool is available. When you run the command "scxadmin -status" you get the same kind of response. But you can see that the programs are replaced with OMI versions. There are noticeable differences in the binaries used in R2 and SP1. This is because of the change from OpenPegasus to OMI. Some binaries are still used but renamed, like 'cimcli'. R2: Less binaries than SP1, provider binaries removed. OMI has other tools for that. Microsoft stated that the upgrade to R2 is seamless except when using custom providers. So testing the response with WS-Man should return the same result. For the test I use an Invoke example which I used earlier. The property StdOut is still the same. This is the result of the command 'uname -a'. The result is the same, but the XmlElement which is returned by the server has some slight body changes. URI => Changed to DMTF. So it looks like the interface is committed to use the DMTF schema. The cimcli tool is used in both OpenPegasus and OMI. 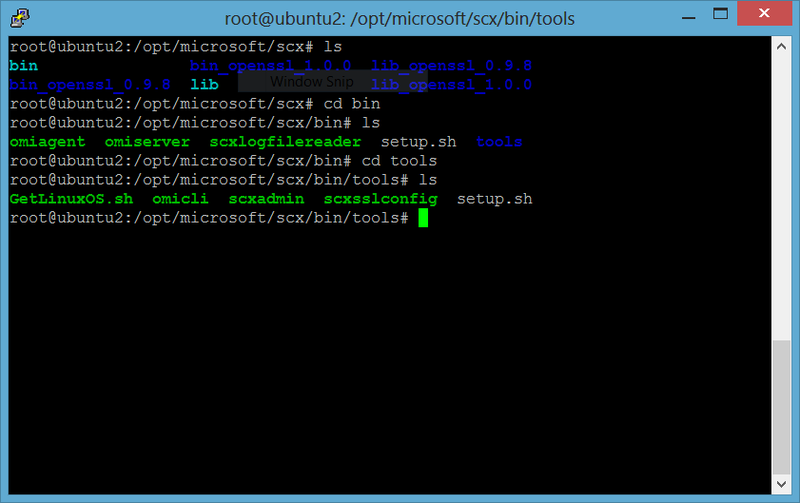 Microsoft renamed the tool from 'scxcimcli' to just 'cimcli'. I tried all kind of things to get cimcli to work, but it keeps failing to run. I copied the lib directory contents to the bin contents, added omicli.conf to the conf directory, added .omiclirc to the cimcli directory. This enumerates the available namespaces of the CIM server. If you have any feedback on my findings, please let me know. Hello, Does the SCOM 2012 R2 works with the Linux SCOM 2012 agents? @Byty, As Microsoft stated the upgrade to SCOM 2012 is seamless unless you have management packs with custom OpenPegasus providers. Agent with SCOM 2012 (SP1) will work with a R2 management server. Are SCOM 2012 R2 XPlat agents available to download?? ?